Haytham Nicolas Hénin (writer), Kyungeun Park (artist) Europe Comics at izneo.com 17 June, 2017 IZNEO HAS PROVIDED WWAC WITH A VIP ACCESS PASS. Based on the true story of a Syrian refugee in France, Haytham: A Childhood in Syria chronicles the life of a Syrian family as they escape an oppressive regime in their home country. 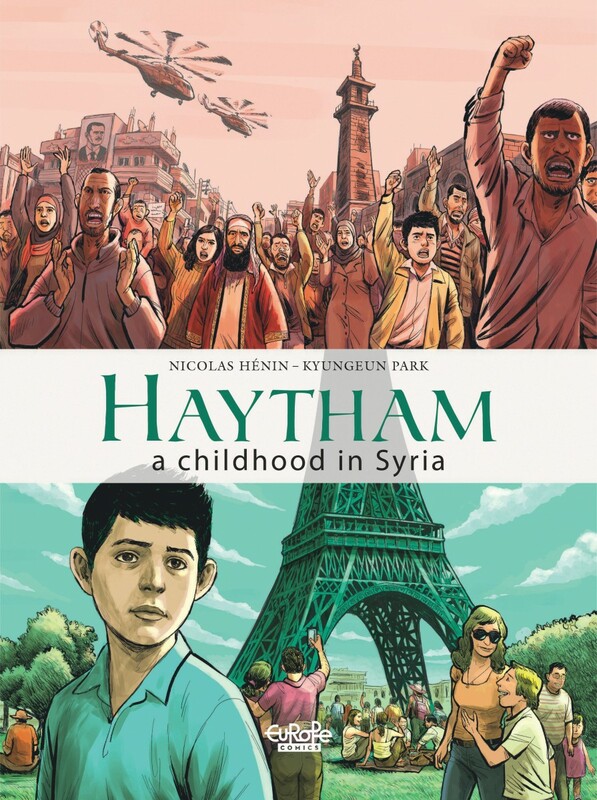 Based on the true story of a Syrian refugee in France, Haytham: A Childhood in Syria chronicles the life of a Syrian family as they escape an oppressive regime in their home country. Haytham al-Aswad and his family live in Deraa, a city near the Jordanian border, which zealously follows the Ba’ath regime, led by Syrian president Hafez El-Assad. When Haytham is four, El-Assad dies, but rather than ushering in a new political system, the Ba’ath regime alters the constitution so El-Assad’s son, Bashar, can take over. It isn’t long before the new government resorts to the old ways of controlling the people. Haytham’s father, Ayman, becomes an activist, pioneering the Damascus Spring, which predated the Arab Spring by ten years. But his activism costs him his job, and soon his security as well. The al-Aswad family come under the radar of the Syrian secret intelligence, the Mukhabarat, and Haytham’s father ends up fleeing the country to France. Haytham’s mother holds down the fort but she too realises that her family has no future in Syria. They then undertake an arduous and terrifying journey out of the country. Along the way, they are helped by friends and strangers alike, till they can once again find a place to call home. This behind-the-curtain look at life in Syria, from the eyes of a child, is extraordinary in its ordinariness. Alongside studying and playing chess, protagonist Haytham describes jaunts to political demonstrations, even as a very small child and against the strict instructions of his parents. At school, he and his classmates take a mandatory civics class where they study Ba’ath party propaganda. These are unbelievable moments from the protagonist’s everyday existence that set refugees’ lives apart from those of others. It is the kind of detail that many of those opposed to allowing refugees into their countries fail to recognise. 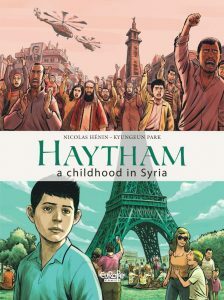 First published in French in 2016, Haytham is scripted by journalist Nicolas Hénin, who was held in captivity by ISIS for ten months. Hénin has been sympathetic to the plight of Syrians and was thus a good choice to tell the story. He manages to convey the youthfulness of child-Haytham in the opening pages, juxtaposing it with the jaded narration of present-Haytham. He keeps an even tone throughout the book while describing the incidents surrounding the protagonist. He never devolves into melodrama but also avoids using a detached voice while narrating the events. 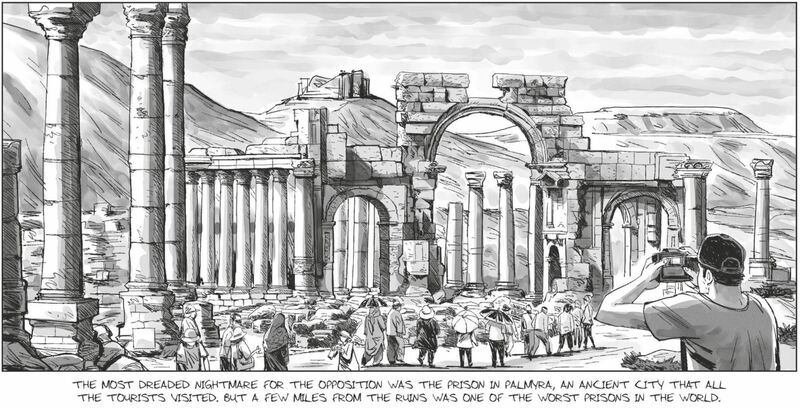 Comparisons between Haytham and Marjane Satrapi’s phenomenal true story Persepolis should be expected. Haytham is an incredibly well-told story that holds up even in translation. The dialogue feels realistic and flows excellently. Haytham’s voice dominates the novel, much like Satrapi’s does in Perseopolis, and draws the reader into the story. For Hénin to capture his subject’s voice so consistently throughout the book is a great achievement. Though this is undoubtedly Haytham’s story, it is good to see that the characters around him are also developed. We witness Haytham’s father hard at work as an activist; he has an entire arc during the book which is fully realised. Haytham’s mother gets to enjoy the spotlight from time to time and is the centre of the book’s tensest moments when she is taken away by the Mukhabarat. The only member of Haytham’s family who does not get much of a look-in is his younger brother, Moussa, who appears only in a handful of panels, most likely due to his youth. Hénin is ably supported by the art of award-winning comic writer and artist, Kyungeun Park. The monochrome sketch and shade style brings the story into sharp focus. There is a remarkable level of detail in his characters’ faces, even in crowd scenes, which makes you linger on each panel. He also manages to bring the cities of the story alive–you get a real sense of the alleyways and busy streets of Deraa, the fertile and open Syrian-Jordanian border that the family cross, as well as the avenues and suburbs of France. Park is equally comfortable with interiors. By the end of the book we almost know the entire layout of Haytham’s home in Deraa, the football stadium turned political jailhouse, the airports the al-Aswads transit through, and the claustrophobic room that the family are crammed into in France. Despite the subject matter and the myriad tense moments peppered throughout the novel, this is a heart-warming story overall, which is very unexpected in this genre. Most stories based in the Middle East tend to be dark and depressing, mired in shocking tales of betrayal and intrigue. Haytham subverts such expectations with a feel-good story. The al-Aswad family are helped by fellow Syrians, Jordanian soldiers, and French teachers every step of the way. Nobody begrudges their decision or ability to leave the country and once they arrive in France, Haytham only mentions one instance of overt racism. Haytham is a relevant and important story. It is handled with sensitivity and an insight that seems much closer to the subject than one would expect from a biographer. The art is deceptively simple but packed with detail, giving readers an immense sense of place and character. Here’s hoping we can catch up again with the al-Aswad family and their new life in France.